A punching bag provides an effective workout for boxers and fitness enthusiasts alike. 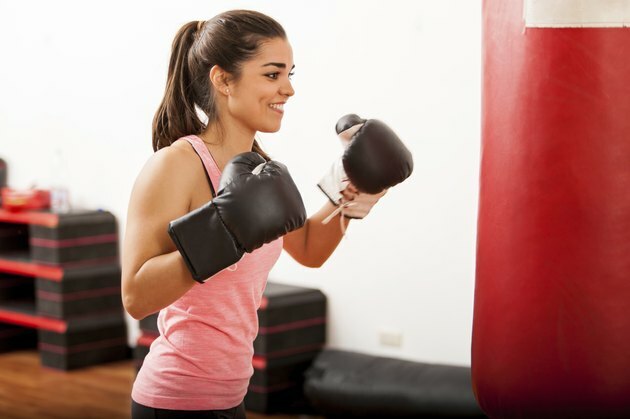 Hitting a punch bag will condition the muscles of your arms, shoulders, chest and core--your abdominal muscles, waist and lower back--as well as burn plenty of calories. At $150-plus, a punching bag can be prohibitively expensive but you can make a homemade version for a fraction of the cost. Always wear hand wraps and/or bag gloves when working out with your punching bag to minimize your risk of suffering a hand injury. Turn the duffel bag inside out and check all of the seams--inspect the seams for weak spots. Reinforce any seams that need strengthening using the sail maker's thread and needle. Turn the duffel bag right side out and begin to stuff it with the clothes or rags. Alternate a 4-inch layer of clothes with a 1-inch layer of sawdust. Compress the filling by putting your foot inside the bag and stamping down the stuffing to pack it as densely as possible. Continue filling the bag until you are 12 inches from the top. Shake the filled bag from side to side and then compress the contents one more time by stamping down on the filling. Close the bag and tie the rope around the neck. Take the middle of your rope and loop it round the neck of the bag. Wrap the rope ends as tightly as you can around the bag making two or three turns and secure with a knot. Make sure that you leave sufficient rope to hang your bag up. Stand the bag on its base and wrap the duct tape horizontally around the bag. Work your way up from base to just below the top in one continuous strip. Make sure that each loop of tape is slightly overlapping the previous one so that no duffel bag material is visible. Repeat this process until you have two to three layers of duct tape on your punch bag. Use the loose ends of rope to secure your punch bag to a suitable overhead anchor. Warm up by performing some light cardio, stretching and shadow boxing before working out with your punch bag. Never hold your thumb inside your fist when punching as this will result in injury.